The other day I jumped off the tractor and my rather jumpy handbrake sprang off as I hit the ground. Luckily I manged to jump back on before it picked up too much speed and stop it. Made my heart beat a bit faster though I can tell you! The second mistake is going to cost a bit more. I opened the window on the tractor to throw my dad a knife and then without thinking picked up the forks on the back. I realised my mistake a second too late and tried to drop the hydraulics but they're not very responsive, there was a loud POP and glass went everywhere. To say I was a bit miffed off is an understatement. Dad just said it could have been him and it was an easy mistake to make, I said I wish it was him that did it! Never mind, just tricky to stop the chickens from roosting in there at night until I get it fixed! 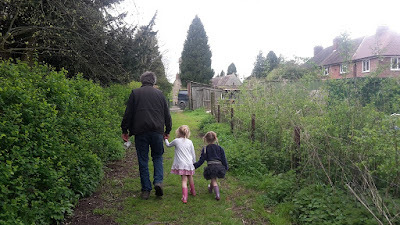 Also thought I'd just put this picture in at the end of dad coming back from casting his eye over my sheep with the girls all holding hands. Made me smile. Anyone else broke a window in a silly way? Come on tell me your stories and make me feel better! Well, I don't have a window story. But I do have an ever-embarrassing tractor story. Many moons ago, the year 2000 actually, I bought my first ever home, it was a condo in the mountains. I lived there practically alone, as the other condo-dwellers were weekenders. I was very new at the country life...and I'd ordered 4 cords of wood to heat my little place that winter. Little did I know how BIG 4 cords of wood were!! I was very young and green. I went to the local tool place to rent a little tractor to haul the wood from the driveway, around my neighbour's condo to the backyard. Let's remember I only knew how to drive automatic. The tractor "guy" showed me how to use it and I tried and despite what I thought I was doing, the tractor wouldn't move forward, and just flew backwards into the woods where it hit a big tree. I luckily jumped off in a panic before it gained speed. I had to embarrassingly call the company to ask for help and told them to just take it back. Luckily there was no damage, only to my ego! But the tractor "guy" didn't have to chuckle when he saw it!!! Does that make you feel better Kev? :) 17 years ago and I'm still embarrassed!!!! ...oh and to boot, I left huge trenches in my neighbour's lawn from the weight of the tractor. OMG...they were so diplomatic though "we're in the mountains, it'll grow back" Whewf! Okay I do feel a little better. and I might have sniggered at you story. Over here every thing is "stick" but soem tractors have around 60 gears so can take some working out when I use one of my fathers newer ones! I think mine was made worse by my dad being stood there! I hate making mistakes but even more so when he's around! Also I'm surprised/confused as I thought condos were in cities! It was an odd set up. In the 1980's some developers from France came to this area and bought a big chunk of land on top of one of the mountains that has a 5 minute walk to a popular ski hill. They built the condos (16 of them), basically like a townhouse set up. The idea was some kind of ski resort. But when they found out that people weren't aloud to just go to the ski hill without registering at the entrance (5 minute walk turned into a 30 minute drive now)...they sold the condos to anyone who would buy them. I remember thinking the same thing when I saw the real estate ad...you drive up through the woods then suddenly a big ugly structure that didn't seem to belong! But the price was right for me at the time, so I can only complain in hindsight lol! My 1954 Ferguson tractor doesn't have a parking brake so I have to cut it off an put it in gear to park. No glass on it either. I just use it to plow mostly and try to stay out of trouble as there are lots of stories of people getting crushed by them around here. I ran over a bench when backing up and crushed it, luckily no great loss. I think I could do a weeks worth of posts with everything I've destroyed or nearly destoryed with a tractor! I'm normally pretty careful when I get out as I've heard so many horror stories! Well, it wasn't a tractor, but my musician husband had his guitar amp in the back of my station wagon. It was standing upright. I was heading home from the hospital at 2 am and had to stop at (the only) stop light when it tipped over backward and broke out my back window. I drove home and parked it in the garage and made him take it in for repairs the next day. Not a great moment. It's that noise as it happens. I remember having boards slid off my roof rack once and that sliding noise was horrible, although luckily no smash with that. Not so long ago I came across a similar looking pile of shattered glass on a small farm track. I never did find out what had happened. 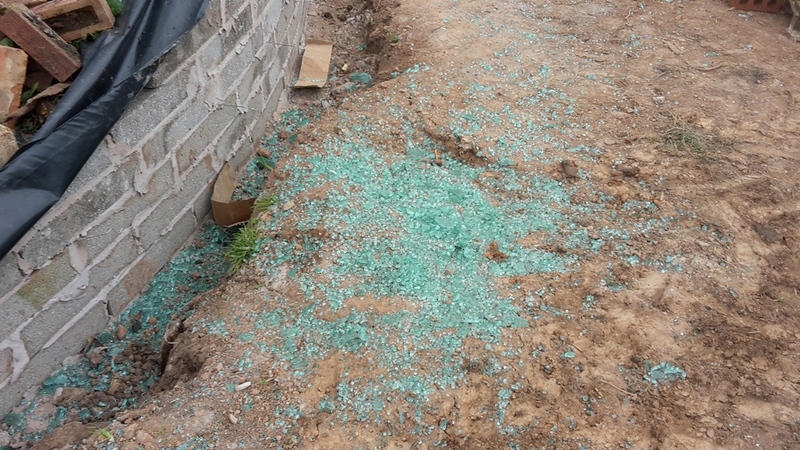 Not a window but a very nasty tractor accident that nearly cost a life! My grandad was tipping sugar beet from an attached hydraulic trailer. 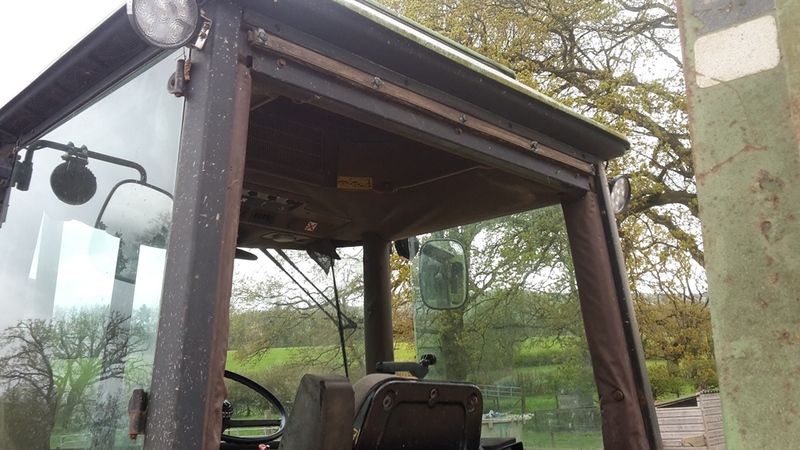 Rather than get out, open the back of the trailer first, then get back in the tractor to switch on the tipping mechanism, for speed he turned on the hydraulics and then jumped out and ran to open the trailer. He got buried by tons of sugarbeet and the trailer gate crushed both his legs as it slowly tipped. Unfortunately he wasn't found for a while and blood loss was huge. He survived (just) but never walked properly again due to all the metalwork in both legs. All for the sake of a short cut! Oh blimey that's taking it up a gear! It must have been horrible as the trailer kept lifting! I'm very careful when I get out the tractor and never have the PTO running, the handbrake is faulty and I need to get it fixed! The year before last I got the digger stuck so bad that I had to wait until it dried out. It sat there for months reminding me that I got it stuck! i had to do a turnaround in a parking lot the other day and hit a pole that was lower than my sight horizon and ripped the side off my car. feeling any better yet? Yeah a little! That must have been a horrible feeling! Oh Kev, glad you weren't hurt. 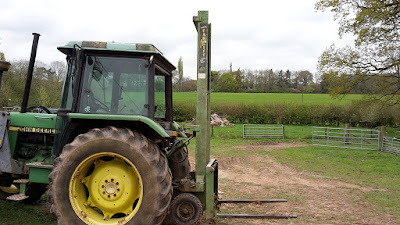 When I first started driving our Kubota, I was concentrating so hard on getting the bucket to go UP, I wasn't paying attention to where I was and when I turned I brutally killed a fence post. Hacked the innocent thing in half after my husband spent good time hand digging it into the ground! No stories, just love the pic of your dad and girlies! Wow - What A Morning!